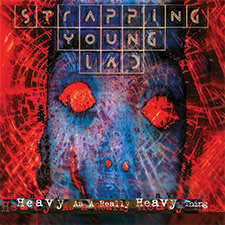 Devin Townsend has always been open about being diagnosed with Bipolar, and it’s abundantly clear on Strapping Young Lad’s out of this world 1995 debut LP. Tracks “Cod Metal King” and “The Filler” have an industrial flavor reminiscent of Ministry and Fear Factory, while “Goat” displays a southern metal tinged groove that stands nicely next to Pantera. Despite poor sales on the initial release nearly 25 years ago, Heavy As A Really Heavy Thing gained a cult following and helped launch Devin’s career into progressive metal icon-status, while simultaneously influencing the likes of Gojira and The Dillinger Escape Plan. With the previous vinyl pressing of Heavy As A Really Heavy Thing nearly impossible to find on the after market, Heavy As A Really Heavy Thing has been in dire need of a repress. Our 2018 version is pressed on 180gram 2xLP vinyl with the 2006 remaster bonus tracks, and housed inside a sturdy gatefold jacket. Limited edition of 1000 copies on red and blue colored vinyl, under exclusive license from Century Media.